Laura McGregor is an avid mixed media artist living in Northern BC. 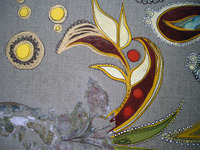 Her preferred medium is gouache paint on linen, that often becomes a dramatic blend of materials, colour, and pattern. More info.